On the instructions of President Maithripala Sirisena, a circular had been issued by the media unit to notify ministries, departments and statutory boards to refrain from holding any functions, meetings or any other programmes relating to their affairs, in Hotels, especially in Luxury hotels. The President had taken this step in order to curb the unnecessary expenditure incurred in holding these state functions in Luxury hotels when there are plenty of auditoriums belonging to the state and other institutions available for these purposes. Are you coming back to sanity???? This is his revenge for hoteliers boycotting him.. Childish..
Parliament is a good auditorium but the presidents re-found friends seem intent on smashing the chamber up and then deserting it before adjourning to the subsidised canteen. Sounds ridiculous ! Is this the only cost cutting measure to be introduced ?After all did the globe trotting the President seems to have seen the hole at the bottom of the coffers at last. Who cares where you have it and what you say. You have totally lost all respect of the people. It now seems Mr. President managing the administration rather than Ranil mortgaging or selling the country. He is such a moron that now wants to take revenge from hoteliers as they were planning to boycott his presence at hotel awards ceremony. Fix a place for your final rights too. 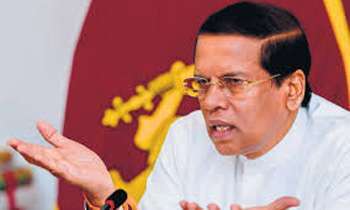 Sirisena is a very revengeful person and is not fit to be a leader of a country. Regardless of whatever, this is a good thing! It will save some money. Get ur heads off ur asses and appreciate a good deed. Still those are ours. Wherever you are we will come to you to make you in to pieces if you don’t resolve the issue in parliament. BE CAREFUL. Remember Gaddafi. I agree but this should hv been the rule form long ago. The hotels are in a bad state with no guests, thanks to the prevailing situation caused by you.